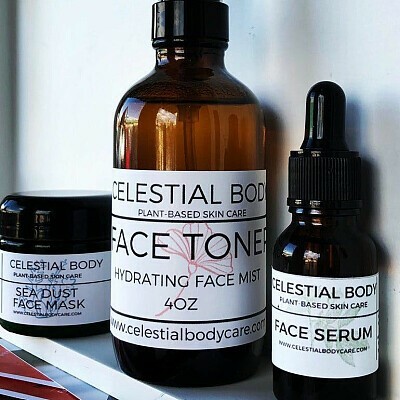 This "Skin Food Kit" will have your face glowing and deeply nourished The BEAUTIFYING SEA DUST MASK comes in a dry powder. Just mix with water for a creamy consistency and put on your face. Made with bentonite clay, spirulina (an edible antioxidant) and a special blend of high quality essential oils that are skin-friendly and nourishing. $15 sold separately) The FACE MIST is a hydrating face mister comprised of Aloe Vera, Rosewater, Carrot Seed oil and ylang ylang essential oils. Great for everyday use, as a refreshing mist or sitting by the pool. Keep in your purse for a fresh spritz and face pick-me-up. ($15 sold separately) The FACE SERUM is our beautiful blend of macadamia nut oil, rosehip, carrot seed and Frankincense and ylang ylang. Perfect to use with the kit or alone. ($30 sold separately) Welcome to your new skin! Glow girl, GLOW!